No bake chocolate peanut butter bites are the perfect treat to satisfy your sweet tooth, and they can be whipped up in less than 10 minutes. 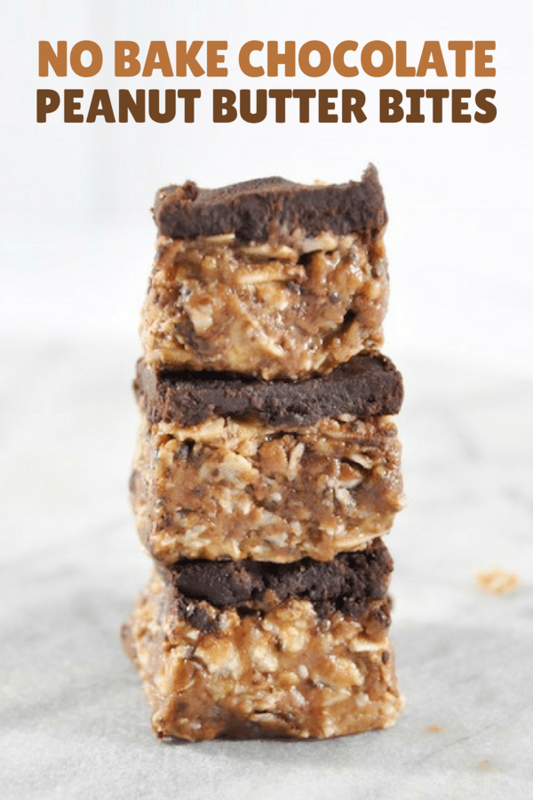 Throw a couple of these no bake chocolate peanut butter bites in your breakfast bowl, or have one as a small dessert – you can never go wrong with peanut butter and chocolate! These no bake chocolate peanut butter bites require only five ingredients and are made without an oven (aka no bake!) Adding cocoa powder to the bars makes them extra chocolate-y and rich. 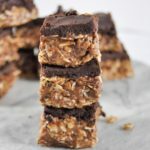 These no bake bites are great because they can be eaten on their own or tossed into overnight oats for an added boost. 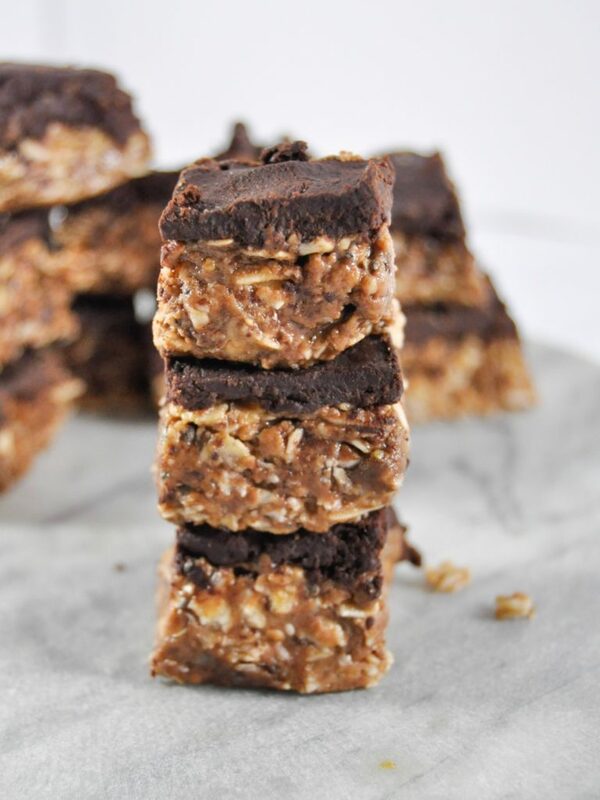 My favorite thing to do with these chocolate peanut butter bites (when I’m not eating them out of the pan…) is to crumble them up and use them as an oatmeal topping. You can use whatever kind of chocolate you want for the topping. I used 100% baking chocolate the first time I made these bites, which added a nice contrast to the sweeter peanut butter mixture. Using such dark chocolate also makes them vegan, an added bonus if you’re trying to stay dairy-free. For those who aren’t dairy-free or into totally dark chocolate, go for a standard semi-sweet chocolate chip or your favorite % of chocolate. Not feeling like small portion sizes today? That’s fine, because you can just skip step number three and eat them in big size. 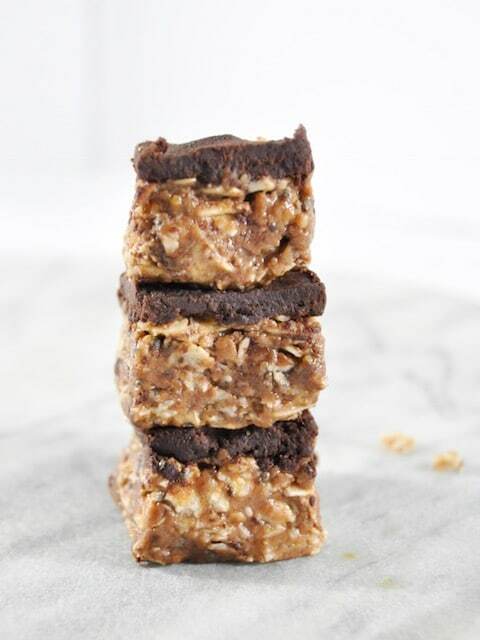 Looking for more easy no bake treats? Check out these No Bake Strawberry Almond Energy Balls! If you give these no bake chocolate peanut butter bites a try, let me know what you think! Drop a comment, rate the recipe, and don’t forget to tag a photo #COZYPEACHKITCHEN on Instagram or Facebook. No bake chocolate peanut butter bites are the perfect treat to satisfy your sweet tooth, and they can be whipped up in less than 10 minutes. In a medium mixing bowl, stir together all ingredients except the baking chocolate. Place the bar mixture onto a flat surface, such as a plate. Using your hands, evenly flatten bars until they are 1/2 inch thick. The mixture should be about 5x5 inches wide. Melt baking chocolate or chocolate chips according to package instructions. Once melted, spread over peanut butter mixture. Let bars cool in fridge for five minutes, or until chocolate is solidified. Cut bars into 1 inch squares. Keep refrigerated in air tight container for up to seven days. These bars are very malleable and can be pressed into a large square shape very easily. For ease of storage, I usually press out of the bars on a large piece of foil, which doubles as a container.